Pakistan Cricket is once again in news for a controversy between some Pakistani players and head coach of the team Dav Whatmore. Pakistani spinners Saeed Ajmal and Abdur Rehman recently made some remarks about the coach Dav Whatmore after which Whatmore responded to these remarks on Social networking website Twitter. Saeed Ajmal made the statement in a Interview on Geo news that Whatmore has failed to make any difference as coach of Pakistan Cricket team and Pakistani Coaches Waqar Younis and Mohsin Khan were much better. Spinner Abdur Rehman also made similar comments about Whatmore. according to Ajmal Pakistani coaches were able to handle the players much better because they knew Urdu language and environment of Pakistani cricket. Whatmore responded on Twitter that I am deeply hurt by the comments of Saeed Ajmal. Whatmore also tweeted that Pakistani players lacks nationalism and they play for money. Later on Ajmal apologized for his comments and also said that his comments were taken wrongly and out of context. This controversy has taken place at a time when there are only 4,5 months left in contract of Dav Whatmore with Pakistani team and there are very less chances that Whatmore will get a renewal of the contract as Pakistani team is not able to perform great under him. recently Pakistan also lost a test and ODI match in from Zimbabwe. 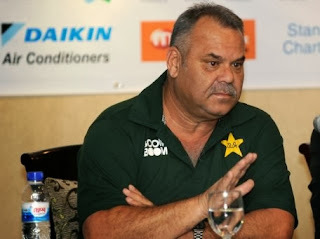 Whatmore is taking 15 Lac salary as coach of Pakistan while local Pakistani coaches where only taking 2,3 lac rupees and under them Pakistani team performed much better.